Over the weekend, I took a short trip up to my old stomping grounds in NYC. The location is the same, but boy has it changed in recent years. Most of the old restaurants and bars we used to love to go to are gone. They’ve been replaced by a lot of commercial and chain stores and restaurants. It’s quite sad. But while in New York City, we did get to a couple old favorites (and some new!). First of course is a staple of ours- a vegetarian restaurant called Red Bamboo. Whether you a vegetarian or not, Red Bamboo is an absolutely amazing restaurant! If you go, be sure to check out the Buffalo BBQ wings. This appetizer will leave you wanting more. They are delicious. These soy protein “wings” are on a stick (bone) and smother in type of honey BBQ sauce. Paired with the vegan blue cheese dressing, this is the one dish I order consistently EVERY time I head into the city – no trip is complete without them. Follow that with an entree of any of their chicken sandwiches (I like the Soul Chicken Sandwich) or the ginger beef and you will be a happy camper. Another favorite of mine is Five Points. Five points was the inspiration for my “famous” sangria as well as my potato pizzette. (recipes for both are available under my recipes) Unfortunately during this trip they were closed for renovations. I’m excited to get back to the city and see what the new place looks like! 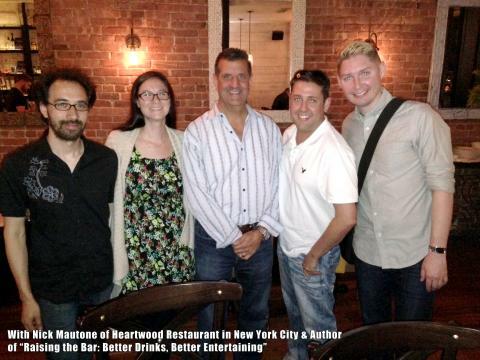 Finally, we get to Heartwood. Before this trip, we had never heard of Heartwood. But while walking around my old work neighborhood, we passed a bar/restaurant that just looked too nice not to try. We were greeted by a friend host, and sat up to the beautiful bar. Chris, the (incredibly handsome) bartender quickly came over and greeted us, told us a bit about the bar, the menu and made some suggestions. Though we didn’t have a chance to eat there (the menu looked phenomenal, but we were on our way to dinner reservations elsewhere) we did have a chance to drink….and,what else really matters? Upon Chris’ suggestion, myself, Rusty and Lauie all got the Veronique. Unfortunately, I didn’t get an exact recipe for it, but the menu says it’s Grey Goose le Citron, St Germaine, Rosemary, Black Grapes, Lemon. I will try to come up with a copy cat for the recipe, but if you go to the bar, just order it. You WILL be happy. You would think the rosemary would overwhelm the drink, but it doesn’t. It’s very subtle and adds a lot to the overall complexity and flavor of the cocktail. Rusty followed that up with a “Wise Old Sage” – a very light, refreshing, fresh tasting drink. Now, even though we didn’t have a chance to eat, I’m going to comment on the menu anyway. First, I’m a pizza JUNKIE, and they have a wood fired oven. I could tell just by looking at the pizzas that they would be on par with the best pizzas I’ve had. The rest of the menu looked like it had a number of high end, interesting recipes – so I’ll be sure to be eating there next time I’m in the city. While sitting at the bar and speaking with the bartender, I noticed a book sitting on the bar called “Raising the Bar.” I asked if they were selling it (it looked like a great book). I was told not only were they selling them, but one of the owners of the bar was the author. His name is Nick Mautone. After checking out the book and realizing the recipes were right up my alley, I asked to purchase a copy. Before I knew it, Nick was there to sign the book and to thank us for coming in. The entire experience really added to our trip. It’s always nice to find a new place committed to everything that makes a local restaurant great. The decor, hospitality and great food and drinks made this a home run for us. We will be back and I highly recommend checking it out for yourself. Keep an eye on the drink recipes on my site. I’m sure some of Nicks recipes will be up sooner than later.